Are you a Sam’s Club shopper? Do you ever wonder if it is worth it to get a Sam’s Club membership? 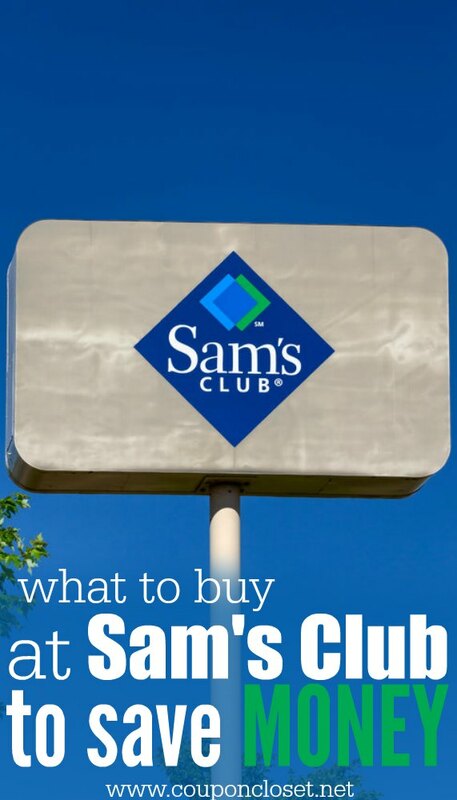 Maybe you have a membership but wonder what to buy at Sam’s Club to save you money. I get this question all the time. Today I thought I would share with you what I buy which it perfect to be apart of our Saving Money on Groceries series. I have several items that I buy at Sam’s because they are usually cheaper there, then anywhere else. 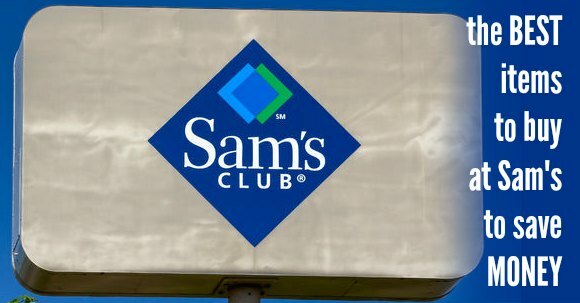 No more wondering what to buy at Sam’s Club to save you money. I buy all types of cheese at Sam’s! Block cheese, shredded cheese and even string cheese are often cheaper at Sam’s then any other stores, even with coupons. The block and shredded cheese is sold in 5 pound increments. The price per pound comes to only about $1.15, so that is way cheaper then prices in the store! Now, 5 pounds is a lot of cheese, but it freezes great. See how I freeze my cheese here. I love buying meat at Sam’s Club! They really do have low prices. I especially look for “reduced for quick sale” meats for the very best prices around. See how I saved over $150 on meat here. Whether you are in the market for fresh chicken, pork or beef, Sam’s Club is a great place to find the lowest prices. Remember, if you do buy “reduced for quick sale” meats, that simply means you need to cook it or freeze it soon. If you freeze it soon, it will still be fresh as the day you bought it when you go to cook it. I buy a lot of salad and produce at Sam’s Club. Since I have a family of 10, we go through a lot of fresh food quickly. If you have a smaller household, you may not want to buy salad or other items that will go bad quickly. However, you can still find nice deals on produce items like bananas, apples, potatoes, cherry tomatoes, and more. One of our favorite treats is trail mix. Of course, a trail mix isn’t healthy if it doesn’t have a variety of nuts in it! 😉 We like buying almond and pistachios in bulk at Sam’s Club. These can be so expensive in the stores and we rarely get coupons for nuts. Also be on the lookout for dried fruit in bulk at Sam’s Club. We don’t buy a lot of it, but I have had people tell me the prices on dried fruits are good at Sam’s too. Milk by the gallon is cheap at Sam’s Club! As cheap as Aldi and Crest. You do have to buy 2 gallons at a time, but for most families that’s not too much of a stretch. Eggs – not keep an eye out on them because they often are very inexpensive. This isn’t a grocery item, but I recently learned that I can save a lot of money on prescriptions just by using the Sam’s pharmacy! This is so nice to know because prescriptions can get very expensive. Talk to the pharmacist about your specific prescription to see if Sam’s might be a cheaper alternative for you. Hopefully I have helped you answer your question of what to buy at Sam’s Club to save you money. I’m curious… what do you buy at Sam’s Club that would be more expensive to buy in the grocery store? Please share your thoughts so others can save, too.